Today I want to briefly explain a replenishment functionality in Acumatica. Acumatica has designed replenishment feature based on most common requirements of SMB companies, however it is extended with advanced algorithms of automatic calculation replenishment parameters based on seasonality or historical transactions. In the same time you need to understand that Acumatica replenishment may not support some powerful replenishment features like advanced demand forecasting based on future SO/PO orders or other forecasting methods. In case of such requirements you can use full power of Acumatica xRP platform flexibility and customizability and you can and there other required features features. Calculation of replenishment parameters (optional) – this is optional process that can automatically suggest replenishment parameters like: safety stock, maximum quantity, and reorder point. These parameters will be calculated for every inventory item, configured for replenishment, separately. Apply replenishment parameters (optional) – this is optional process can apply to inventory items parameters calculated on previous step. Here you can check them before real changes. 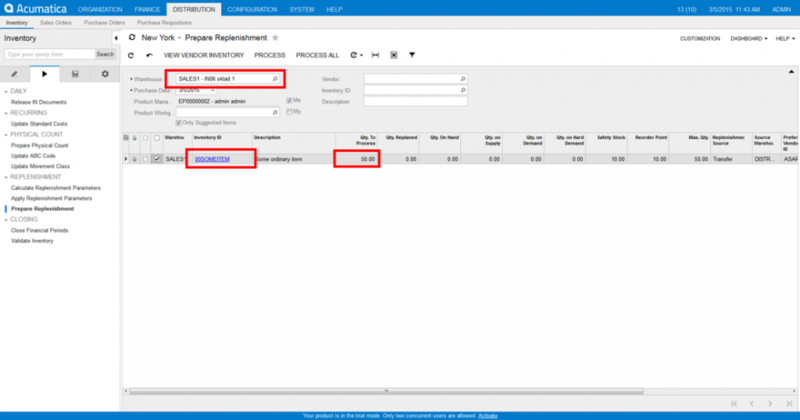 Prepare replenishment – this process with calculate the reorder quantity for each inventory item, configured for replenishment. Calculation will be done based on replenishment parameters that are calculated on previous step or configured manually. This 2 step architecture makes Acumatica replenishment is very flexible as you can easily add other methods of replenishment parameters calculation. Min./Max. Method – this replenishment method allows to order goods to MAX level when goods on warehouse are below MIN level. Fixed Order Quantity Method – upon triggering Acumatica will generate purchasing demand for fixed (configured in-advance) quantity of items. Using the Moving Average Method – This method analyses inventory transactions for past 15 days and suggest parameters based on real sales activities. This method analyse historical transactions and does not count future sales orders. Using Seasonality Parameters for Forecasting – This method can adjust replenishment parameters based on date and increase/decrease required stock items on warehouse. Read more about replenishment process in Replenishment Methods and Their Parameters article. Replenishment can be done by purchasing goods or by transfer from main warehouse. 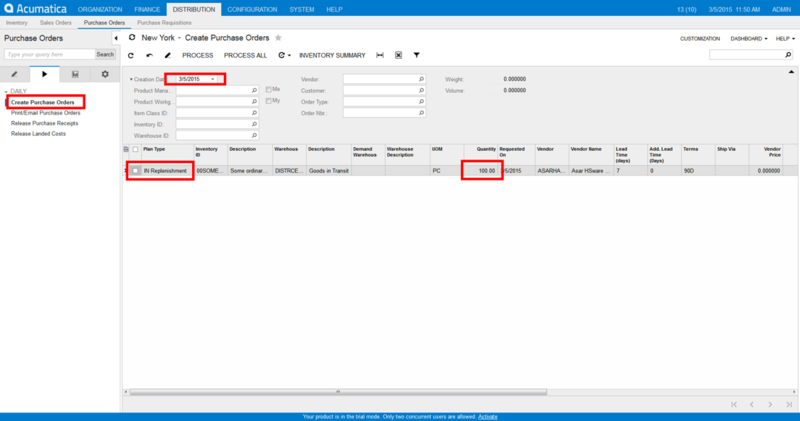 Also replenishment process does not generate the purchasing documents immediately, it just rises the demand and later you’ll need to create a purchase order on a separate screen. That helps to split responsibilities of different departments.